*When printing, be sure to select the correct paper size for the document. Print out one of the color versions to hang in your room, or use in class with your students. You can use the black and white versions for your younger students as a coloring assessment page. This product works well for students to practice reading notation, playing Orff instruments or Boomwhackers. 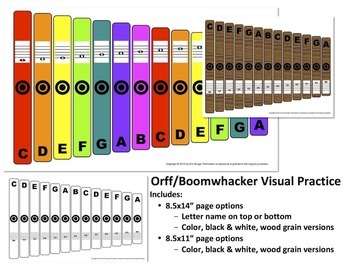 Each page features 13 colored bars that correspond to both Orff instruments and Boomwhackers. It includes the note name at the top like Orff instruments (except for one page that has the note name at the bottom), and the corresponding treble clef note as well. It also has a fun target in the middle of each bar to help students know where to strike the bar on Orff instruments. Please note that the G bar color appears teal on many computer screens (which is the intended color), but when printed from certain printers, it appears aqua. After purchasing, you may print as many copies of these pages as you need for ONE CLASSROOM, but please do not share. Instead, direct them to my seller page so they can purchase. Thank you!